Organizing your closet may seem like a daunting task, but regardless of whether you’re looking for solutions to help organize your closet better or for practical solutions for making the most out of your closet space, Space Age Closets, the home of the top custom closet organizers and designers in Mississauga, have the following tips for customers to maximize their closet space. Sort: Completely empty your closet and sort every item of clothing: shirts in one pile, jeans and pants in another, clothing you wear to work out, etc. Even accessories, such as shoes, ties, belts, and scarves, should get their own pile. Purge: While cleaning our your closet, you’ll doubtlessly come across items of clothing that you haven’t worn in years, whether because they don’t fit, have gone out of style, or a number of other reasons. Regardless of why, you have to decide if you still want to hold on to them. If they’re in good condition, you should consider donating the clothing; otherwise, there are also clothing recycling services available as well. Inventory: This is a step we recommend that anyone curious about our custom closet organizers and designers in Mississauga perform before calling us. Once you do this, you should have a good idea of what types of storage you will need. 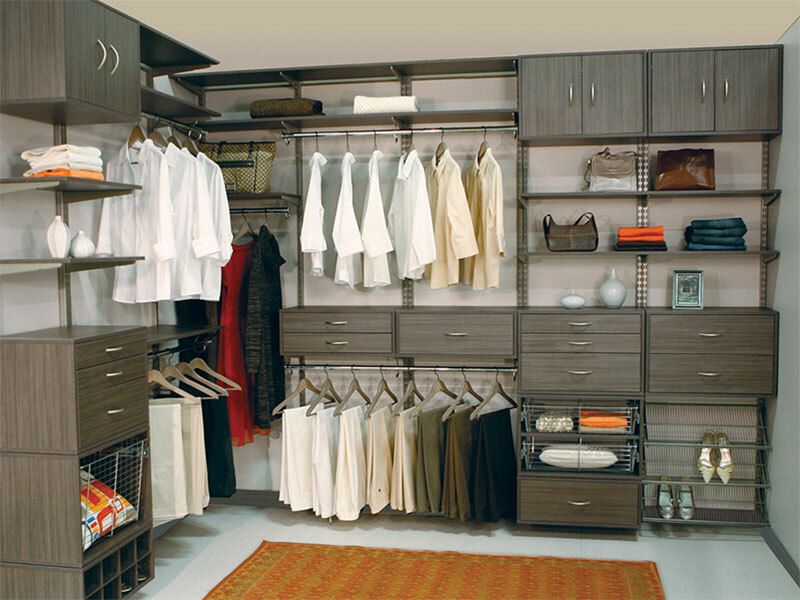 Design: Once you’ve decided on a solution that works for you, we will create custom closet organizers and our designers in Mississauga will create a system that makes the most of your available space. We offer a variety of options for getting the most out of your space. Double-hung rods are good for shirts since they compress space and allow you to get more room in your closet. Full-length hanging for clothing like pants and skirts can allow for more room above and below. Drawers are ideal for sweaters, undergarments, and similar clothing. We will also install pull-out shelves for shoes and handbags. Items like ties and other hanging clothing accessories can be mounted on the back of the door, the wall at the back of the closet, or even the sides of the shelf towers for easy access. Some of the other tips we have to get the most out of your closet space include storing any out-of-season clothing or clothing you don’t wear that often in out-of-the-way spaces. Cutlery drawers can be great for storing and organizing accessories. Finally, use the same type of hanger; this lets you hang clothing evenly and makes it easy to find. You can benefit from these tips for our custom closet organizers, and our designers in Mississauga will also provide further advice on how to maximize your space. Call Space Age Closets today for more information!It will happen eventually: that time will come when your son or daughter, who you swore just lost their first set of teeth, are off to university or have secured a career and they’re moving out. As a parent, it’s definitely an emotional moment; having your child leave means that they’re all grown up and don’t need to rely as much on mommy or daddy anymore, and that can be a tough pill to swallow. But it’s inevitable, and a good way to get over the sombre feelings is to redo the now-empty bedroom. Redoing a room is a great way to embrace the change, according to Space Age Closets, a leading provider of custom closet organizers and designers. Yes, having your son or daughter move on with their life can be a bit overwhelming, but the opportunity to put an empty bedroom to use can be exciting. Start by taking a “before” picture of their bedroom; when your child comes back to visit and doesn’t recognize anything, it would be nice for them to have some reminders of what the room was like while they still lived at home. After that’s out of the way, brainstorm some ideas of how best to revitalize the bedroom and turn it into something either usable or memorable. Something usable would be a guest room—the one you always wanted but never had. Take down those posters they left behind, pick some colours, and start painting. Remove that old single bed your child’s been sleeping on since they entered adolescence and replace it with a wall bed. Add in some custom cabinetry, and now you have a dual-purpose room that you can utilize for both yourself and overnight visitors. Another neat way to configure the new empty bedroom is by having it serve as a “dedication” or “memory” space. All those special pieces that you’ve collected over the years of raising your child—report cards, drawings, medals, etc.—can be obtained from the basement or garage and arranged in the bedroom as a way of showing how far they’ve come. This is a good idea if your son or daughter is going off to school but will be back for the summers. You’ll still need to clean and paint the room, but it’s a good way to hold onto the memory of their childhood. It might even be a good idea to ask for your child’s opinion on how to go about redecorating—one last bonding opportunity! Space Age Closets can execute either of these concepts. Wall bed units can fold easily within surrounding custom cabinets and we carry a variety of colours to match whichever theme you’ve decided to create in the bedroom. And of course, we are masters at designing custom cabinets that add to the aesthetic of any room in the house. Think about it. That time is going to come anyway; maybe it already has. Don’t waste the opportunity to infuse some energy into your home by taking on a relatively simple task. Space Age Closets can help. Our consultations are complimentary and we’ll work with you to carry out any idea you come up with. Check out our web site at spaceageclosets.com or give us a call at 416 239 1202.